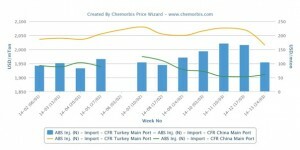 Turkey’s import ABS market has been seeing some discounts since the second week of March despite hike attempts from sellers of some Far East Asian origins as per the pricing service of ChemOrbis. These discounts were mainly attributed to falling butadiene and ACN costs in Asia and generally limited activity ahead of local elections at the end of March. This week, new April prices for South Korean and Taiwanese ABS started to be revealed with decreases, contradicting previous speculations about renewed increase targets from producers, who were said to be struggling to preserve their margins. Upstream, spot butadiene prices lost $15/ton on an FOB South Korea basis week over week while butadiene prices indicated a larger drop of $150/ton from early March. Spot ACN prices posted relatively modest declines of $10/ton on a weekly basis and $30/ton from the beginning of this month, both on a CFR Far East Asia basis. The fall was reportedly attributed to weak demand from downstream markets. Spot styrene prices also softened $10/ton on an FOB South Korea basis from last week, whereas prices still represent a $50/ton increase from early March. A second trader commented that demand is not great in the ABS market but he hopes to see a slight revival following the elections this Sunday. “We received April prices from Taiwan with $50/ton decreases. However, we do not plan to purchase any cargos for this origin as we prefer non-dutiable South Korean materials instead,” he highlighted. “It is hard to predict the future direction of the ABS market given lower butadiene and higher styrene costs in Asia,” another trader commented. 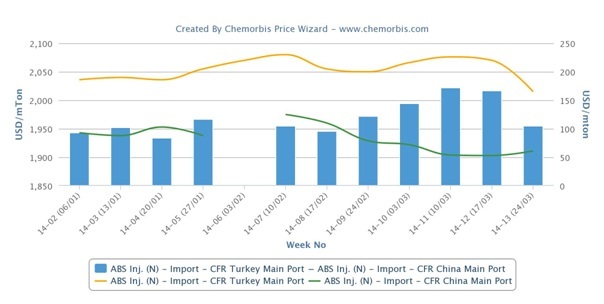 Based on the prevailing Far East Asian ABS offers in China, theoretical prices would come to around $1920-1950/ton for South Korean origins and $2010-2040/ton for Taiwanese materials on a CIF Turkey basis. This calculation shows that the recent ABS natural prices in Turkey have still some room to move down, particularly for South Korean cargos. Looking at Asian markets, ABS prices have shown no major changes this week as producers reduced their production rates and are not willing to compromise on their offers given their unsatisfactory margins. Buyers, on the other hand, are mostly remaining on the sidelines, commenting that the weakening yuan has affected demand from China.